The Roosevelt Grille is closing its doors, but owners of the building say rumors that the so-called "Casino Block" in Ketchum was bought by a Las Vegas investor are untrue. Tom Nickel, longtime owner of the Roosevelt, which opened its doors on Main Street in 1997, said multiple rumors have cropped up regarding the restaurant's closing—but none are true. "One rumor I heard was that I was being evicted after not paying rent for six months," Nickel said Thursday. "I've paid the rent every month for 15 years." Nickel declined to comment on the exact circumstances of his restaurant's closure, but did say that the transfer of the building's lease was not due to a lack of profitability at that location. "The Roosevelt was profitable," he said. "It wasn't my idea to leave." Nickel said he plans on retaining the lease on the Sawtooth Club, his remaining Ketchum restaurant. A community website started a firestorm on June 25 when a blogger posted that a Las Vegas-area "consortium of investors" had purchased the entire Casino Block, the Main Street property that includes the Casino Club, Roosevelt Grille and Rico's Pizzeria. "That couldn't be further from the truth," said Brian Barsotti, a Ketchum attorney representing sibling owners Kevin Werry and Kerry Ann Armstrong. The property has been in the Werry family since 1936, and the siblings themselves were born in the Sun Valley Lodge and raised in Ketchum. The block was listed on the market in July 2007 with a price of $13.9 million for five buildings housing eight businesses. The listing included 23,500 square feet and two liquor licenses. But co-owner Armstrong said the property has been off the market for years. "It's not on the market and it has not sold," she said, adding that she removed the property from the real estate market two or three years ago when values tanked. "The economy really got bad, and we decided it was not a time to try and sell it," she said. 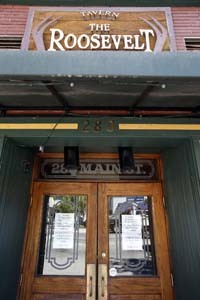 Armstrong did confirm, however, that local computer consultant Timur Beriker and his brother, John, have taken over the lease for the Roosevelt Grille and plan to open a restaurant there. "There's really no story there," she said, but declined to shed light on why the Roosevelt Grille's lease was not renewed. "I think that's between Tom and me," she said. "It's not really public knowledge." Armstrong blamed the website posting for stirring up rumors surrounding the restaurant's closure. "The only way I can figure how this happened is that [Beriker's] dad just moved to Las Vegas," she said. She said there are no plans to relist the property. The posting has since been removed with a lengthy redaction, citing "Ketchum power players" and a "North Valley-based real estate friend" as original sources for the erroneous post. Meanwhile, Nickel said The Roosevelt officially closed earlier this week and he will spend the next few days clearing out his equipment and other restaurant items. "That's a big job after 15 years," he said.